In recent months, China has been desperate to inject more credit into its financial system and failing that, to at least give the impression it is doing that. Recall that last month the PBoC adjusted its definition of aggregate financing (or Total Social Financing) by including net financing through local government special bond issuance, which in turn took place just two months after it added asset-backed securities (ABS) and non-performing loan write-offs into this measure. Why did China revise its TSF yet again? Simple: the purpose was to "pump up" the credit numbers and telegraph to the market and consumers that Chinese credit is growing faster, and thus represent a stronger economy, than it is in reality. And indeed, the September jump in TSF was driven mainly by a faster local government bond issuance, while based on the previous definition, it fell to a weaker-than-expected RMB1,467bn from RMB1,518bn and below the RMB1,554 consensus, weighed upon by continued contraction of shadow banking financing and a decline in net corporate bond financing. Fast forward to today when overnight the PBOC reported its latest money and credit data, and even under the latest and broadest definition, October money and credit data surprised sharply on the downside, mainly due to the ripple effects of the initially over-zealous deleveraging programme and despite pressure by regulators on banks to help keep cash-starved companies afloat, pointing to further weakening in the economy in coming months. And while October is typically a slow month for Chinese credit, growth in key gauges such as total social financing and money supply fell to record lows, reinforcing views that policymakers will need to step up efforts to revive flagging investment. According to the PBOC, new RMB loans dropped in half to RMB697bn in October from RMB1,380bn in September, with new loans to the corporate sector tumbling to RMB150bn from RMB677bn in September, in which new medium- to long-term loans eased to RMB143bn from RMB380bn, and new short-term loans fell to -RMB113bn from an increase of RMB110bn. New loans to the household sector also eased, to RMB564bn from RMB754bn in September, and its long-term loan component was down to RMB373bn from RMB431bn. New loans to non-bank financial institutions were -RMB27bn from RMB60bn in September. Household loans accounted for 80.9% of total new loans in October, versus 54.7% in the preceding month. One reason for the sharp drop in new loan growth: Chinese banks have become wary of a fresh spike in bad loans after years of pressure from regulators to reduce riskier lending. 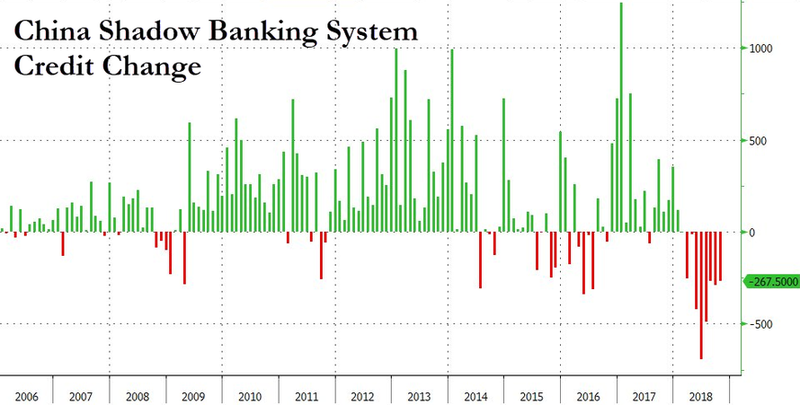 Last Friday, Chinese bank shares tumbled on fears they will be saddled with more non-performing loans following an unprecedented regulatory directive to allocate one-third of new loans to private companies. In its financial stability report earlier this month, the central bank highlighted the sharp rise in household debt in recent years, noting it needed to be monitored, which is bizarre coming just as Beijing is hoping to flood the system with even more cheap credit. Analysts have warned the jump could undermine Beijing’s efforts to spur consumer spending. Outstanding short-term consumer loans rose 37.9 on-year in 2017 and the total household debt to GDP ratio was at 49 percent at the end of last year, the central bank said in the report. ... mainly weighed on by a sharp fall in local government special bond (LGSB) financing (RMB87bn from RMB739bn in September) and continued shadow banking shrinkage. In fact, China’s outstanding total social financing (TSF) slowed to 10.2 percent from a year earlier, another all-time low suggesting the increased lending barely compensates for shrinking “shadow” loans. The amount of newly increased broad TSF (non seasonally adjusted) was the lowest since October 2014. As noted above, headline aggregate financing slumped to RMB729bn in October (Consensus: RMB1,300bn) from RMB2,168bn in September. Growth in outstanding aggregate financing slowed further by 0.4% points (pp) to 10.2% Y/Y in October. 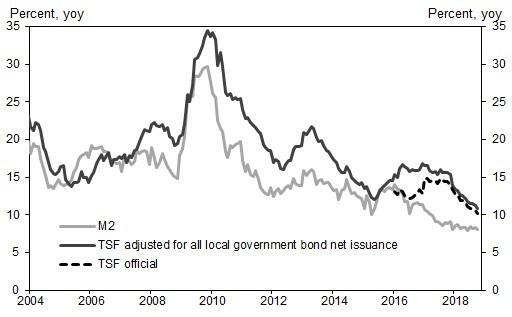 If central and local government bond financing is included, growth in the aggregate financing measure fell to 10.7% Y/Y to 11.2%. 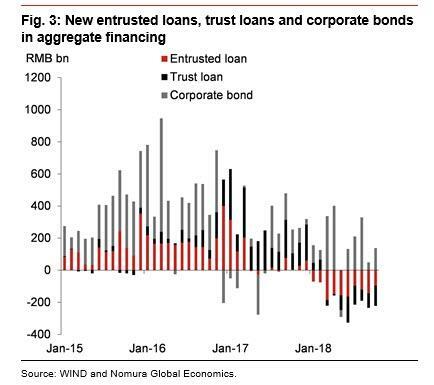 By category, new entrusted loans and trust loans combined were -RMB222bn in October from -RMB234bn in September, indicating that shadow banking activity continued to contract. Net corporate bond financing rose to RMB138bn from RMB49bn in September, but was still some way off the average October level in 2015-17 of RMB233bn. Net equity financing remained sluggish, at RMB18bn from RMB27bn in September (average October level: RMB62bn). One key reason for the decline was that local governments had maxed out their bond quotas after a rush of debt issuance in the third quarter, Capital Economics said. After a lengthy clampdown, Beijing has been pushing local governments to spend on infrastructure projects again as part of its growth boosting measures. China will release investment data on Wednesday along with industrial output and retail sales. Meanwhile, looking at traditional outstanding loan growth eased to 13.1% y-o-y from 13.2% in September (Figure 1), while money supply growth was also markedly weak, in further evidence that companies are reluctant to make fresh investments as U.S. tariffs on Chinese goods add to uncertainties about the demand outlook at home. Broad M2 money supply grew 8.0 percent in October from a year earlier - a record low, and far below the consensus estimates of 8.4%, edging up from September. Including central and local government bond issuance, growth of the augmented aggregate financing measure dropped to 10.7% y-o-y in October from 11.2% in September. Both posted the lowest growth on record. The weaker trend also suggested overall credit conditions in China tightened last month despite recent easing in monetary policy, including moves by the central bank to bring down market interest rates and four cuts in banks’ reserve requirements so far this year. Indeed, one likely explanation for the shockingly poor new credit numbers is that according to the PBoC’s Q3 monetary policy report last week, weighted average lending rates for general loans and mortgage loans rose to 6.19% pa and 5.72% in Q3, respectively, from 6.08% and 5.60% in Q2, although those for corporate bill financing fell. Rising financing costs signal further downside pressures on investment and property sales, and as a result, Nomura believes that the economy has not yet bottomed. In its China credit growth commentary, Bloomberg said that the "shockingly" weak new loans number, which was worse than any surveyed economist expected, "explains why policy makers have projected a sense of urgency lately to support growth. It suggests that the credit market is clogged as the government cracks down on shadow banking while lending to private firms has more or less frozen." Looking ahead, headwinds to growth remain, especially from weakening domestic demand, rising credit defaults, the cooling property market and escalating China-US trade tensions. Although headline activity numbers may have held relatively well in recent months (benefiting from a front-loading of exports and a significant easing of the anti-pollution campaign this winter), Nomura expects a more visible growth slowdown starting from the spring next year. Most analysts, however, don’t expect policymakers to cut benchmark rates any time soon, but could step up tax cuts and infrastructure spending to put a floor under the slowing economy. Implicitly allowing some major Chinese cities to ease property price controls and scrap other measures that distort the property market. “October credit data is weaker than expected,” said Merchants Securities analyst Luo Yunfeng. However, Luo believes the room for further policy easing is limited as Beijing remains concerned about controlling debt and financial risks, which were fuelled by past spending binges. The question, of course, is what happens if China's credit remains clogged up: that could be a major problem for China, which as discussed over the weekend, already has over 50 million vacant apartments. What is strange is that unlike in 2009, 2012 and 2015 Beijing has shown little appetite for housing-led stimulus - the type that would also bolster the broader emerging markets - as shown see in this chart comparing China's credit impulse and the number of cities with rising home prices. This means that infrastructure-led stimulus has far less bang for the buck, according to UBS. And if the new credit injections are unable to make their way into the economy, it's only a matter of time before home prices follow China's credit impulse deep in the red, potentially unleashing the biggest housing-led Chinese recession observed in over a generation, one which may or may not be accompanied by a working class insurrection.